Please find the link to 2017 Registration of Interest for the White Ribbon Ride. 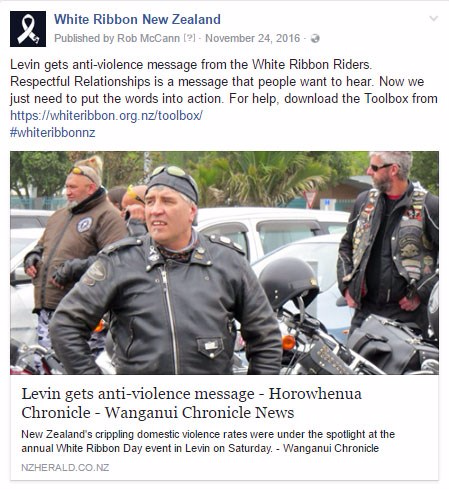 The White Ribbon Ride is one of the most exciting initiatives tackling this country’s crippling domestic violence record. Violence destroys families, sets our children on a destructive journey and affects one in three women. 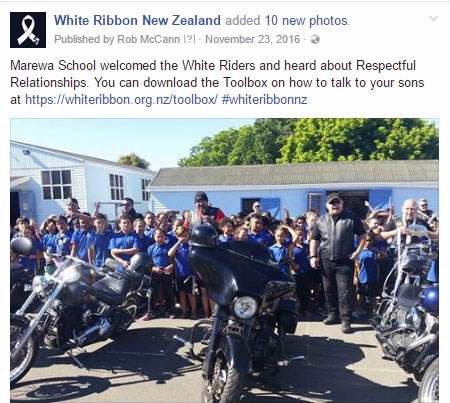 This week-long motorcycle tour happens every November – White Ribbon Month, and is a powerful and inspirational voyage for all involved. 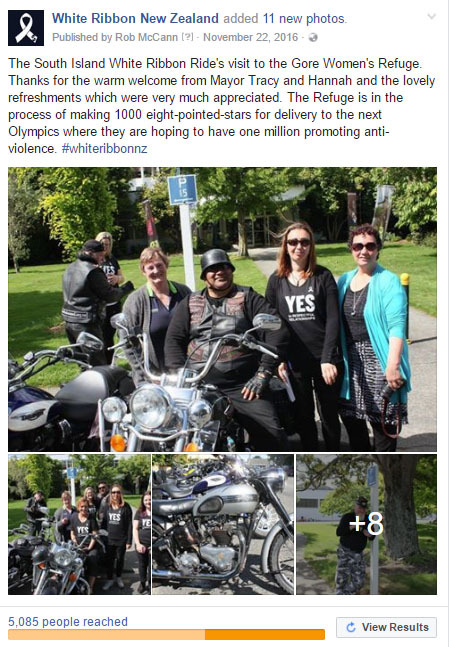 A lead group of riders steer convoys through towns in the North and South Islands, picking up support riders in every region along the way. Events are organised in every town, ranging from school visits, marches and breakfasts, to fashion parades, quiz nights and Dads and Lads days. Every event is an opportunity to bring men’s violence into the open and get people talking. The schedules are designed to keep the riders safe, and visit as many communities as possible, and we will put a draft schedule together very soon. 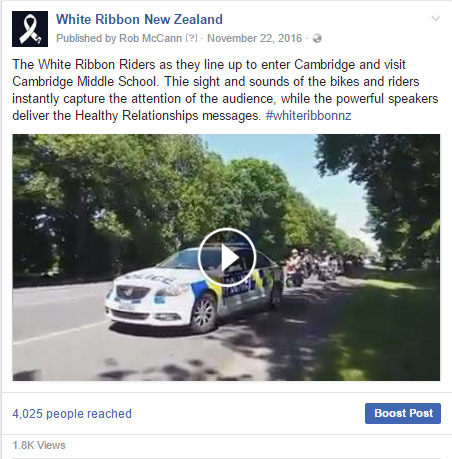 If you are keen to host, or work with other agencies to host the riders, please fill out the Registration of Interest (ROI) and send back to ride@whiteribbon.org.nz. Don’t worry if you are not ready to complete the second page. At this stage, we simply want to know who is interested; specific details can be provided at a later date. Where there is more than one agency or community group in each town, we will put you in touch with each other to see if you can work together. This varies from town to town. The minimum number should be 8-10. This is negotiable, but they need to be tightly organised at about an hour to an hour and a half. Do we have to feed the riders? No, but it is always appreciated and we suggest healthy foods (no pies or almost no pies). Do we have to accommodate the riders? No, but this does help to bring down the costs that the riders have to cover. The riders will all be under the banner of ‘White Ribbon Riders’ and include riders from many different clubs. Will there be posters for each event? Yes, we can provide PDFs for the Ride and for each event. 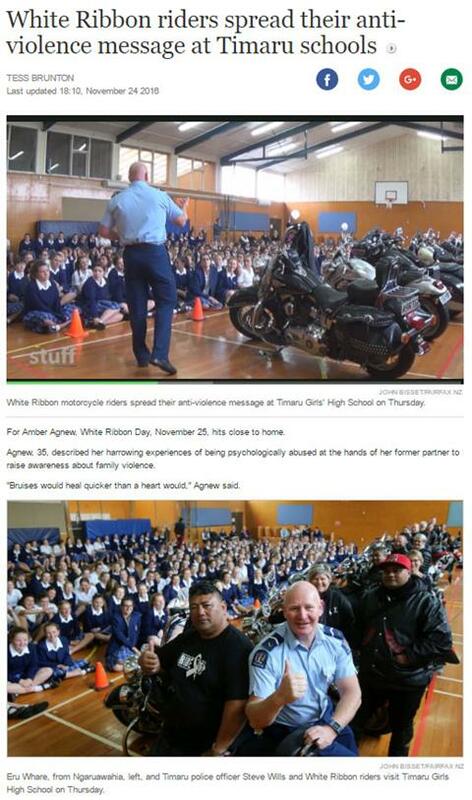 Please email your question to ride@whiteribbon.org.nz. 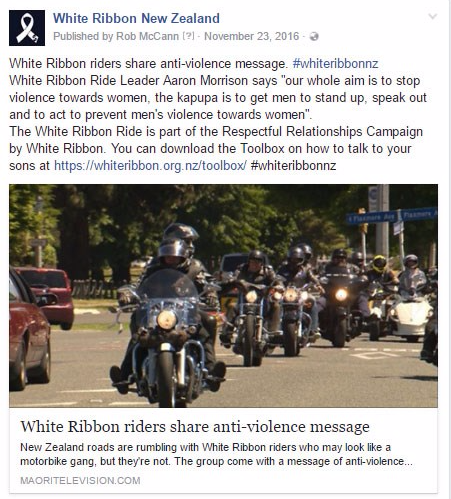 Who is organising the White Ribbon Campaign/ Ride? 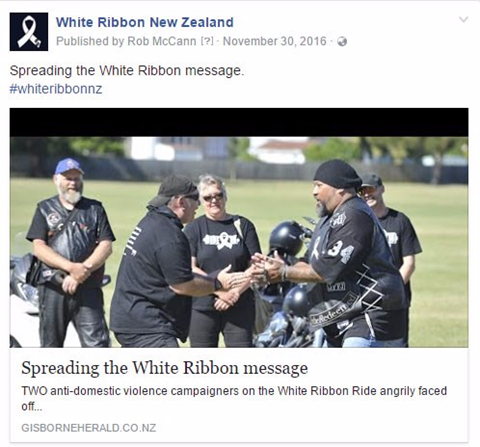 White Ribbon is organised through the White Ribbon Campaign Trust and the campaign work is actioned by the campaign team. Liz Griffin, our new White Ribbon Assistant Manager, will be heading up the White Ribbon Ride Project. The Ride Leaders (Colin, Takurua and Aaron) and Trust Representative, Jackie, work with the campaign team. How do I ensure I have the most up-to-date ride schedule? 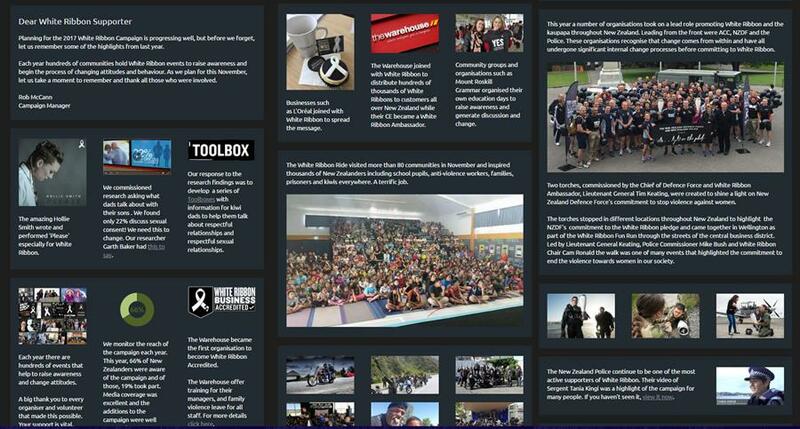 Ride Itineraries are updated regularly and located on the White Ribbon Ride page at www.whiteribbon.org.nz. What if there is a mistake on the schedule? 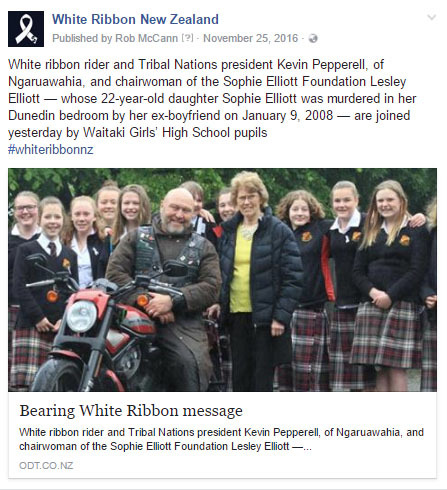 Email us at ride@whiteribbon.org.nz and we will correct the error. Do I need to fill out the Run Sheet? Not yet, but prior to the ride as we need to provide this information to the ride leaders to ensure that event activities and expectations are clearly understood. We also need this information for the White Ribbon 2017 Event Listings. We look forward to hearing back from you and working with you in 2017.